Fit Fluential Mom: A Story Before Bed from Anyone, Anywhere, Anytime! A Story Before Bed from Anyone, Anywhere, Anytime! Do your parents, grandparents or other family members live too far away to enjoy treasured moments with your little ones? Do mom or dad spend nights away from the family for work? If so, A Story Before Bed is the perfect website for you. 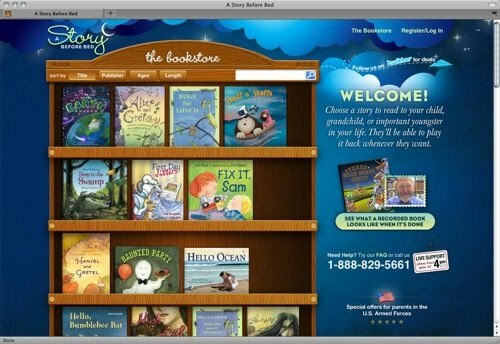 It allows those that are miles and miles away to create treasured memories by reading stories to your kids online. All they need is a computer, an internet connection and a webcam. They can choose from over 150 books with new titles added each week. For a limited time, Itsy Bitsy Spider is available for free if you register with the site. For only $29.95, you have full access to every book for the full year. That's less than $ .20 per book! Want to surprise grandma? Have your kids read a story to her. The pages of the books turn automatically and the audio/video follow along with the book as you read. Not sure you can pull it off? Record it for free and don't pay until you're satisfied. After it's purchased and recorded, you can watch it as many times as you want on your PC, Mac or ipad. Turn bedtime stories into treasured memories with A Story Before Bed today!